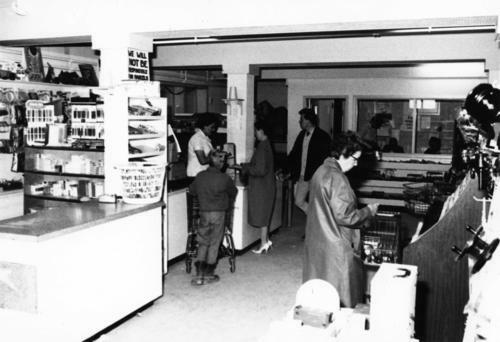 Photograph depicts woman in right foreground with shopping cart, selecting an item from shelf. Unidentified men, women and child can be seen in background. Store appears to be stocked with groceries and general supplies. Handwritten annotation on recto of photograph: "RIGHT MARG MCKENZIE". Item is part of the Cassiar Asbestos Corporation Ltd. fonds. Image is one of 45, see also items 2000.1.1.3.19.33 - 2000.1.1.3.19.77. Physical description: Handwritten annotation on recto of photograph: "-2". Alpha-numeric designations: Original accession no. : 2000.1.0685.029 [this photograph came from box 685].